Today I started my second course of Plant-Based Nutrition, “Diseases of Affluence”, at eCornell. I just can’t get enough of Dr. Campbell’s lectures and the course readings. Despite our beautiful, crisp day, I was at my desk and on my computer for a good part of it. By the time I emerged from the office, it was apparent that I really needed to make something for dinner that was not going to take a lot of prep. My two girls had homework assignments and sports activities planned for the evening, so I had to think of something quick. Staring at me from my fruit bowl, were to 2 gorgeous looking avocados. It was time to make Chloe’s Avocado Pesto Pasta! This recipe has been bookmarked since Christmas morning when I unwrapped “Chloe’s Kitchen” by Chloe Coscarelli. 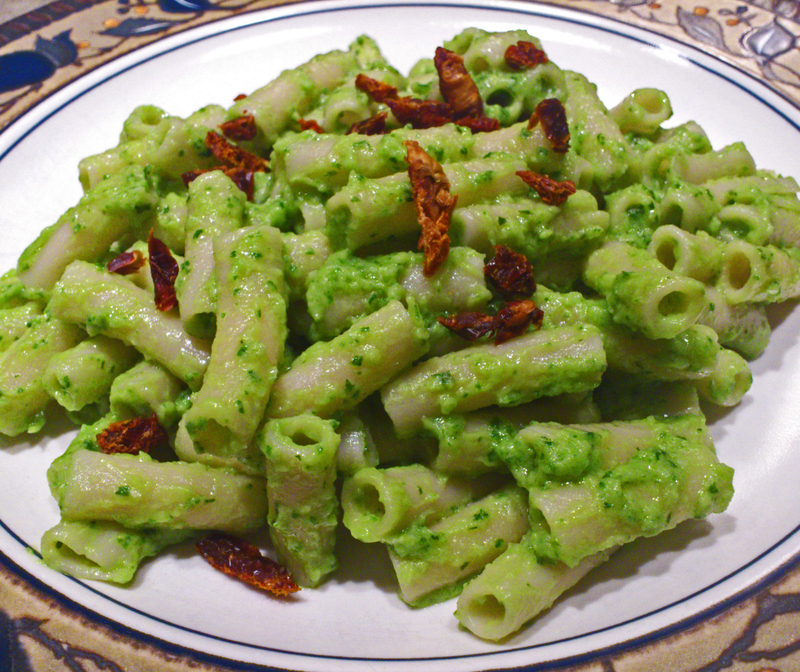 Here is the recipe – http://chefchloe.com/entrees/avocado-pesto-pasta.html . I made two substitutions. I did not have pine nuts, but I did have some raw sunflower seeds. So, I threw them in the food processor with the other ingredients. I also changed up the noodles and served this pesto with gluten-free, brown rice penne pasta. My pasta dish was then garnished with some of my sun-dried tomatoes I had made earlier in the Fall. No need to shy away from avocados. Yes, they are high in fat, but the fat is a healthy kind – the kind your body needs. According to Joel Fuhrman, M.D., in his book “Eat to Live”, “If the fats you consume are healthy fats found in raw seeds, nuts, and avocados, and if your diet is rich in unrefined foods, you needn’t worry so much about the fat – unless you are overweight”. This entry was posted in Meals and tagged avocado, gluten-free, nutritious food, pesto, recipes, vegan on January 16, 2013 by uberdish. I have a mean desire these days for miso. I absolutely love the sweet and salty taste it gives to my soups, salads and stews. After a long weekend of indulging, tonight I was wanting something light for dinner. I tossed my miso dressing with kelp noodles and created a delicious raw meal. No cooking this evening! A traditional Japanese seasoning, miso is made from fermented soybeans, grains, or beans. I used a mellow white miso paste made from fermented soybeans. I highly recommend a certified organic soy miso because of the widespread use of genetically modified non-organic soybeans. If you haven’t had kelp noodles, you must give them a try! Don’t let the whole sea vegetable thing turn you away. These noodles are fat-free, gluten-free, and low in carbs and calories. They are slightly crunchy and pick up the flavour with what you mix them with – like miso dressing. Mix oil, vinegar, agave, miso, and garlic with a fork or immersion blender. Place rinsed noodles in a large bowl. Pour dressing over noodles and mix well. Add desired choice of veggies and give noodles another toss. This salad is wonderful the next day, too! This entry was posted in Meals, Soups and Salads and tagged gluten-free, kelp noodles, miso, raw, recipes, salad, vegan on November 27, 2012 by uberdish. Oh, these crepes are absolutely delicious! A surprisingly easy to make meal, we had them last night for dinner with steamed broccoli and a fondue-like cheese sauce that’s literally to-die-for. You would never guess that this meal is gluten-free and vegan. The crepe recipe comes from my Candle 79 Cookbook by Joy Pierson, Angel Ramos and Jorge Pineda. If you are ever in New York City and looking for an awesome vegan meal, try Candle 79. It’s a quaint restaurant just minutes from Central Park. This recipe makes 10 crepes. Just to let you know, we are a family of 4 and there was not one crepe leftover. If you like to have some extra for the following day, then you may want to consider doubling the recipe. Try this with leftover crepes – instead of using rice or noodles, try cutting crepes in thin strips for a next day’s soup! Using a blender, process the milk, flour, arrowroot powder and salt to a thin, smooth-like consistency. 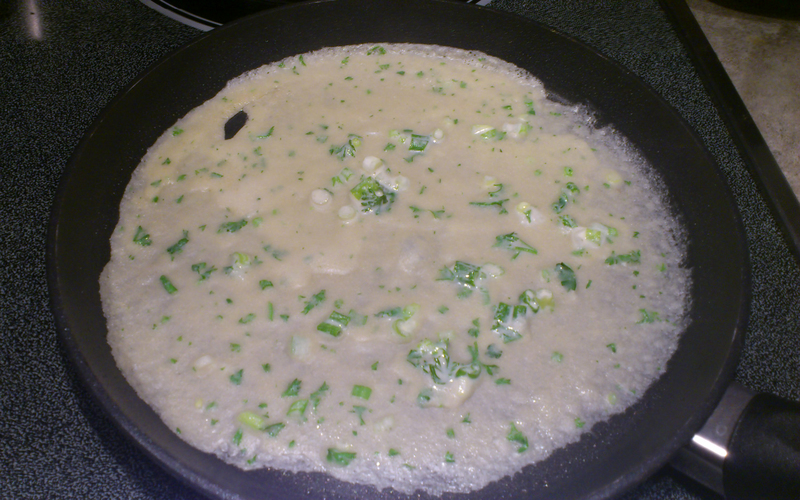 Pour into a large bowl and add the parsley and green onions. Mix well. I let this sit for about 30 minutes while I prepared my broccoli and cheese sauce. Brush a crepe pan with coconut oil and heat the pan over medium heat. Pour about 1/4 cup of batter into the center of your pan and tip it several times off of heat to cover the bottom of the pan. Return the pan to the heat and cook for at least 3-4 minutes until the edges begin to brown. Using a spatula, flip the crepe and cook for another minute. Your crepe should be lightly browned. Your crepe should flip easily. If it is sticking to the pan, then wait another minute. If you try to flip the crepe too soon, it will fall apart! Stack crepes on top of each other and keep warm until serving time. Serve with your choice of steamed vegetables and sauce. But, seriously – try the above fondue sauce! 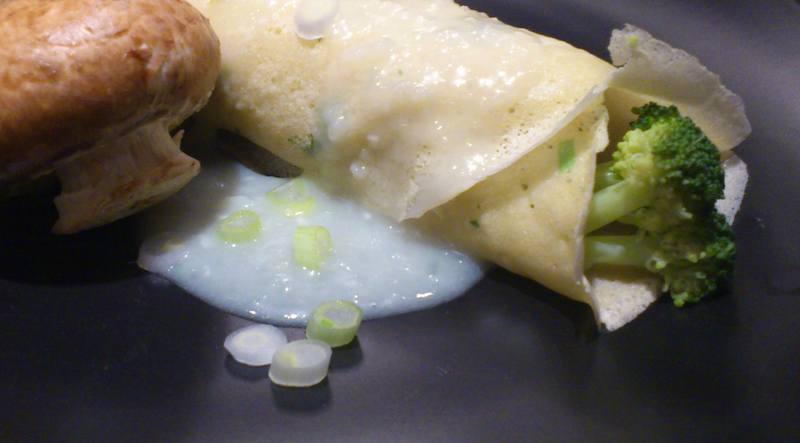 I would like to thank my daughter for assembling this crepe and organizing the photo shoot. While I was involved in an online “chat” with fellow Plant-Based Nutrition students, she decided to take charge and get dinner on the table. (My kids now know that we don’t eat until snapshots have been taken!). Can you tell she loves mushrooms?! Thank you, K!! This entry was posted in Meals and tagged cheese sauce, crepes, gluten-free, nutritional yeast, recipes, vegan on November 19, 2012 by uberdish. One pot meals are pretty big in our house during the weekdays. Between work and the kids’ school projects and activities, it can be a challenge getting the family to sit down at the table for any length of time. For us, it’s ideal having our meal in one big bowl. This Spanish rice dish is so versatile. You can add any chunky vegetable that happens to be in your refrigerator. For this particular dish, I used eggplant, red pepper, onion, garlic, fresh tomatoes and a can of Eden adzuki beans. This dish works wonders with chickpeas or green lentils, too! This recipe is inspired by one of my first vegetarian cookbooks, “The Ultimate Vegetarian Cookbook” by Roz Denny. I bought this shortly after I moved into my first apartment and discovered that I can’t survive off of steamed rice and veggies for the rest of my life! Many of the recipes are vegan and many I have easily altered to a gluten-free recipe. Steep the saffron in 3 tbsp of hot water. Sprinkle the eggplant with salt and leave to drain in a colander for about 30 minutes. Rinse eggplant and pat dry. In a large frying pan, heat the oil and fry the onion, garlic peppers and eggplant for a few minutes. Sprinkle in the paprika and stir. Mix the rice, then pour in the stock, tomatoes, saffron and salt and pepper. Bring to a boil then simmer for about 15 minutes, uncovered. Stir occasionally. Stir in the adzuki beans and continue to cook for another 10 minutes. Serve hot from the pan. * Adzuki beans are small red beans high in protein and high in fiber. They are also high in iron, potassium, folate and magnesium. Adzuki beans are the second most popular legume in Japan, next to the soybean. You may also find adzuki beans in some delicious desserts. Remember….if you are using canned beans, don’t forget to look for the Eden brand. All Eden cans are BPA free. 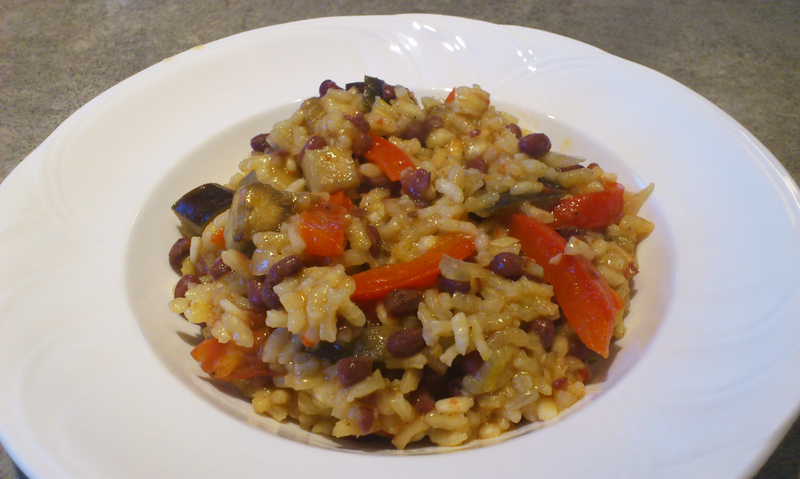 This entry was posted in Meals and tagged adzuki beans, eggplant, gluten-free, Meatless Monday, paella, recipes, rice, saffron, vegan, vegetarian on November 12, 2012 by uberdish. My turning slicer has been one of my best kitchen gadget purchases. Costing less than $50 Cdn, it’s been a wise investment in our health. I love how I can take a zucchini, carrot, beet or sweet potato and transform each into a beautiful plate full of spaghetti-like noodles. 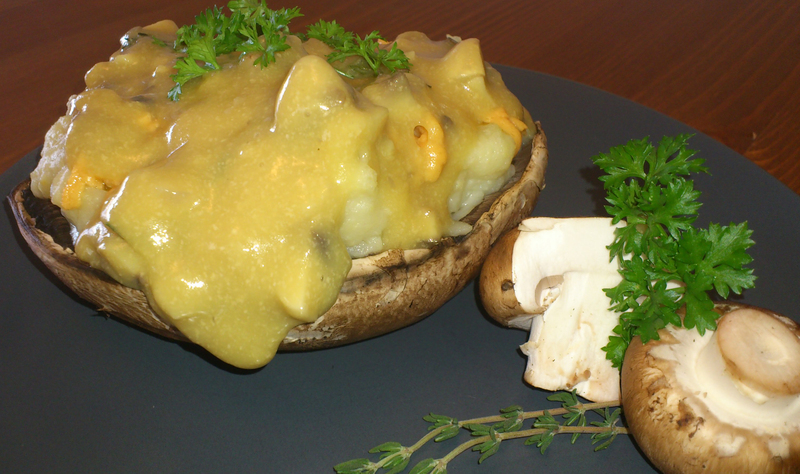 Mixed with a creamy sauce consisting of nuts, these dishes are to die for! A raw marinara sauce is good too, but I prefer the creamy “nut based” sauces full of ginger and garlic. This dish is not only delicious, but it is filling. You would never believe that a plate full of raw vegetables and nuts could fill your belly to the max, but it does. And, that’s not just me talking. My occasional meat-eating, dairy-loving husband agrees! Pictured above are the zucchini noodles I made for our dinner last night. The sauce was easily made using a glass bowl and a whisk. The organic zucchini I purchased the day before was put through my turning slicer about an hour and half prior to eating. I prefer to let the noodles sit and dry for a bit on a large dinner plate before I mix them with the sauce. I try to make about 50% of our meals RAW during most of the year. In the summer, it is naturally more with all the vast in-season fruits and vegetables available at our local farmers’ markets and organic grocery stores. We didn’t always eat this way, though. Yes, our meals were (mostly) vegetarian, but maybe only 10% raw because I didn’t know of all the creative ways to present vegetables. It was my sister-in-law, Sharon, who first introduced me to the raw food diet. I believe it was in the early summer, a couple of years ago, at our family cottage. She brought to the dock a variety of raw food books – “Ani’s Raw Food Essentials”, “Living Raw Food”, and“Going Raw”, just to name a few. I was intrigued! Honestly, I never thought raw foods could look so darn appetizing. Don’t get me wrong, I have always loved every vegetable out there, but these “un-cookbooks” were making my mouth water! The photos in these books showed dishes of soups, noodles, crepes, wraps and the yummiest looking desserts. All the things we love. (And to think that I believed raw food meant only big salads and beautifully cut carrot sticks!). Below is a photo of my turning slicer. If you are a little curious, give this recipe a try. Purchase a spiralizer or turning slicer. If you are in the Toronto area, I would like to suggest that you visit Wanigan Organics. When you are in there, talk to Sharon and be sure to try their raw banana crepes or raw banana crackers. Yum! Don’t hesitate to change the veggies up a bit. I’m constantly doing that. You can also substitute the cashew butter for any other nut butter. I’ve done that a few times. For this dish, I used what was available in my fridge. 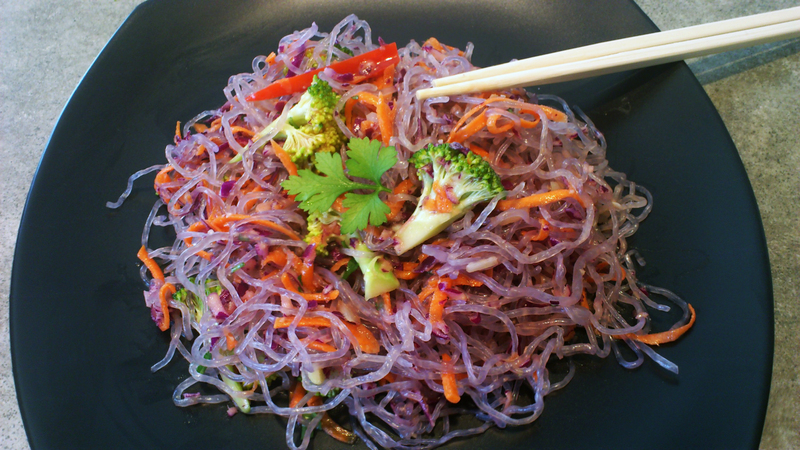 This recipe is inspired by Ani Phyo’s recipe for sesame noodles in Ani’s Raw Food Essentials. Place all ingredients in a small blender or use a handheld blender to blend until smooth. Not wanting to dirty mine, I whisked all ingredients together in a large bowl. *Coconut aminos is a soy-free seasoning made from the nutrient-dense sap of a coconut tree. It contains 17 naturally occurring amino acids, vitamin C, as well as a spectrum of B vitamins. If you can’t find coconut aminos, you may substitute it with a tamari or soy sauce. 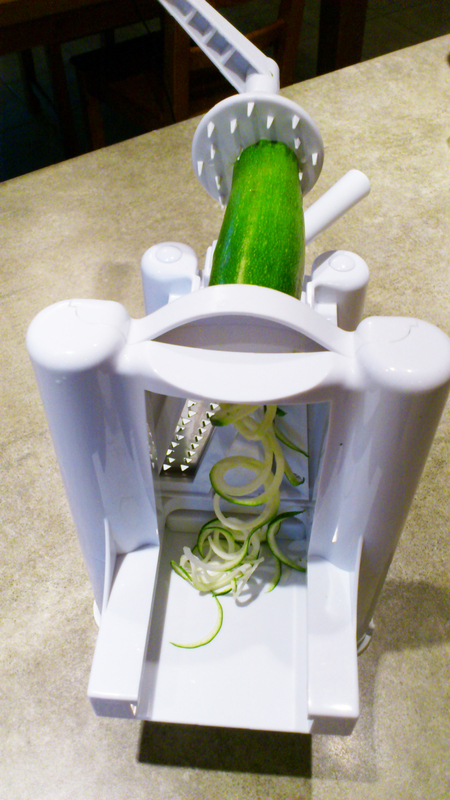 One at a time, turn zucchini and carrots on turning slicer to form spaghetti-like noodles. Toss in a large bowl with sauce and all the noodle ingredients. Top with chopped nuts. 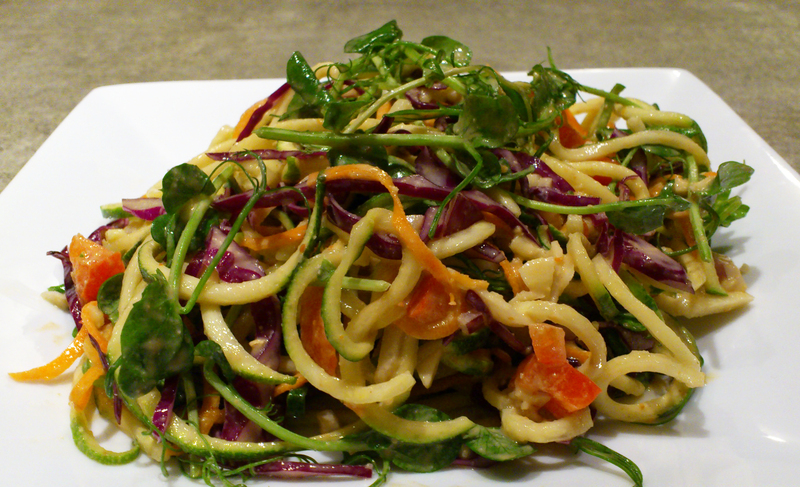 This entry was posted in Meals and tagged Ani Phyo, cashew butter, coconut aminos, gluten-free, raw, recipes, spiralizer, vegan, zucchini on November 3, 2012 by uberdish.